Pulling Sheet Piles | THERMO Spoken Here! 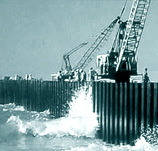 Sheet piling are driven to form temporary barriers in waterways, to put in bridge footers, to lay fuel lines and such. Once placed, the longer the piles remain (especially in salt water), the greater the headache they are to remove. Worth salvage, the embedded piles must come out, one at a time with their connecting edges intact. By watching a load gage mounted on the drag-line boom, experienced operators can decide when salvage is worth the wear that removing them will put on the lifting machine. Sometimes the piles are pulled and scrapped. A laborer connects the boom cable to a pile. Then the operator powers-up the machine. The load sketch shows the machine lift force versus (z), the upward displacement of the top of the pile. The first inch, while the pile breaks free, taxes the equipment the most. Estimate the work required to extract one piling. ♦ About 16 piles per hour are connected, lifted then disconnected. There are great losses between the horsepower rating of an engine and what actually gets done.